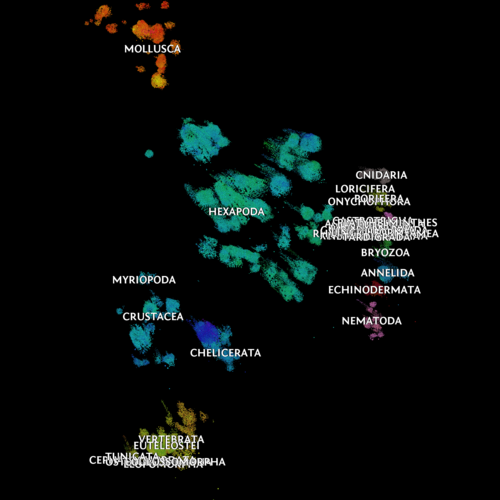 There are many approaches and tools for visualizing taxonomic, phylogenetic, and similar data. Why another one? Just for the fun of it, really. The resulting top-level image for the animalia (i.e. all animals) is shown below, or try the interactive demo. Note that this layout technique is not guaranteed to faithfully follow the hierarchical structure of the taxonomic tree. However, this relational structure should be broadly retained (i.e. the closer a pair of nodes in the layout, the more taxonomically similar they should be). This isn't a final product by any means: there's plenty of scope for refinement. Label overlap is obviously problematic. Labels are currently rendered as part of the image itself: adding the labels dynamically as text elements would be a better solution, and would also allow each one to be hyperlinked to a corresponding taxonomic information page. Update 2-Feb-2014: labels are now added dynamically, rather than embedded into the images. This also allows each to have a pop-up that links to images and information pages about the taxon. See the updated interactive demo. Posted on Wednesday January, 29 2014 at 18:25:00 .